Introduction: Laparoscopic appendectomy is generally performed with 3 ports system. We have performed single umbilical incision laparoscopic appendectomy (SUILA) using a wound retractor without ports from the year 2006. 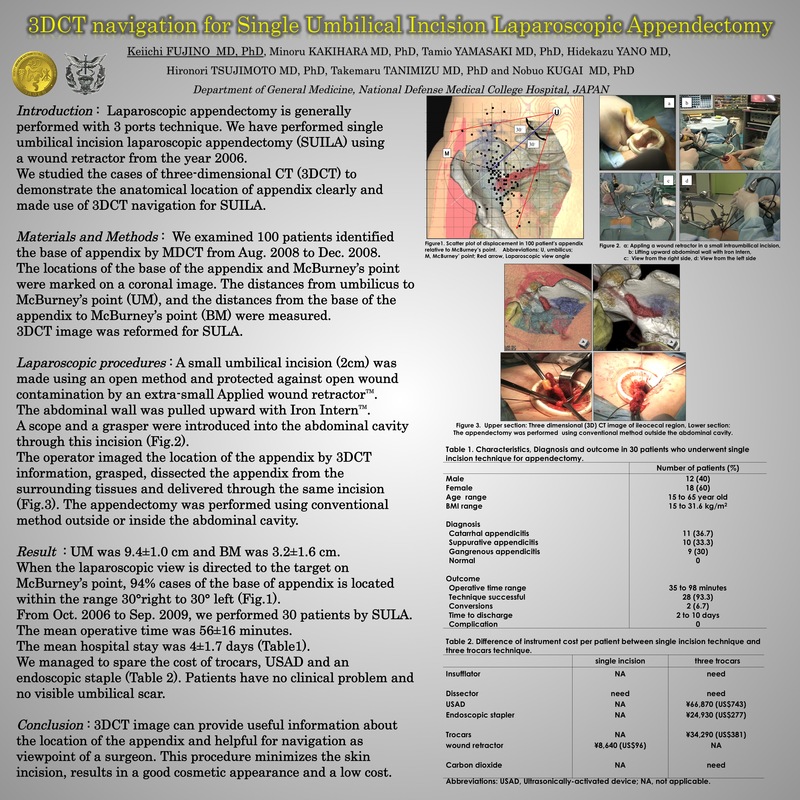 We studied the cases of three-dimensional CT (3DCT) to demonstrate the anatomical location of appendix clearly and made use of 3DCT for SUILA. Materials and Methods: We examined 100 patients identified the base of appendix by MDCT from August 2008 to December 2008. The distances from umbilicus to McBurney’s point (UM), and the distances from the base of the appendix to McBurney’s point (BM) were measured on a coronal image. In some cases diagnosed as acute appendicitis, 3DCT images were reformed for SUILA. Laparoscopic procedures: A small umbilical incision (2cm) was made using an open method and protected against open wound contamination by an extra-small Applied AlexisTM wound retractor. The abdominal wall was pulled upward with Iron InternTM. A scope and a grasper were introduced into the abdominal cavity through this incision. The operator imaged the location of the appendix by 3DCT information, grasped, dissected the appendix from the surrounding tissues, and then delivered the appendix through the same incision, pulling down the abdominal wall. The appendectomy was performed using conventional method outside or inside the abdominal cavity. Result: UM was 9.4±1.0 cm and BM was 3.2±1.6 cm. When the laparoscopic view is directed to the target on McBurney’s point, the base of appendix is located within the range 30°right to 30°left in 94% of the cases. SUILA were attempted in 27 patients, the mean operative time was 60±16 minutes. The mean postoperative stay was 4±1.7 days. The patients have no clinical problem and no visible umbilical scar. Conclusion: 3DCT image can provide useful information about the location of the appendix and helpful for navigation as viewpoint of a surgeon. This laparoscopic procedure minimizes the skin incision and shows a better cosmetic and lower cost result compared to three ports system.